When it comes to films about historical events, like Titanic, The Assassination of Jesse James by the Coward Robert Ford and Lincoln, one knows how they will end before even starting them. Yet, such movies can be just as, if not more entertaining and gripping than movies where one does not know what is going to happen. The same is true for the arresting Zero Dark Thirty, which also sends out a potent message to America’s enemies. The film is a politico-historical drama based around real events. 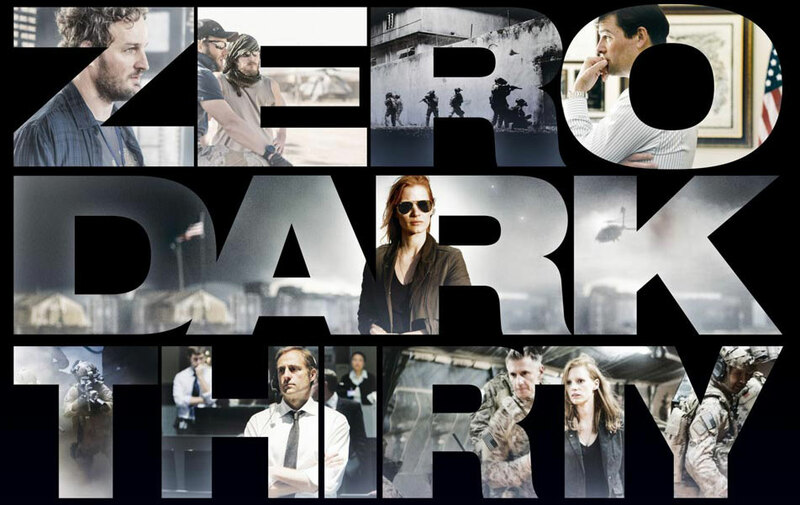 ‘Zero dark thirty’ is a military codename for half past midnight, and it is the time that the operation to kill Osama Bin Laden took place on the night of 1st/2nd May 2011 in Abbottabad, Pakistan. 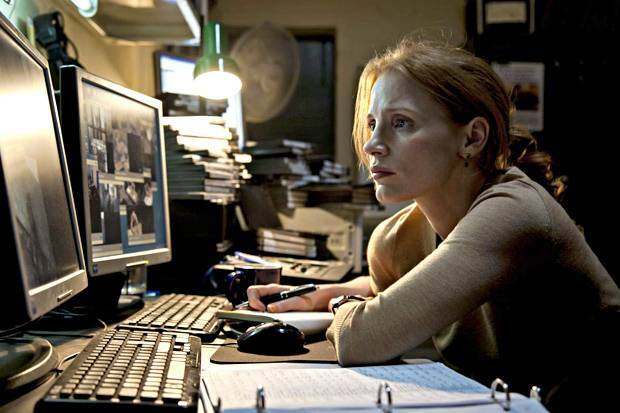 Maya (Jessica Chastain), baggy-eyed as she watches countless interrogations of detainees in her attempts to find a lead to Osama Bin Laden’s location. Zero Dark Thirty is all about the CIA’s attempts to find the world’s most wanted man following his masterminding of the terrorist attack on the Twin Towers on 11th September 2011, and his subsequent vanishing. The film is an unhurried, yet captivating thriller that does not feel like it is 157 minutes long. Like with The Hurt Locker, it has a grounded feel, and therefore lacks the hyperbole and surrealism of 24. Even the ending mirrors this mood, which is rare and noteworthy for Hollywood. It is too early to know how true Zero Dark Thirty is to the reality, but it feels like a realistic and fair representation of events. First, it illustrates how dangerous it is for Americans to be in Afghanistan/Pakistan, thereby emphasising how heroic they are being out there. Second, it demonstrates some of the difficulties CIA agents face operating in the field, trying to unearth information about their targets (who have multiple identities and never seem to stay in the same place twice). Third, the movie shows the CIA adopting dubious torture methods and degrading treatment upon suspected and actual terrorists in undisclosed locations in their desperate bid to find leads on Bin Laden. There has been much controversy over Kathryn Bigelow’s depiction of torture adopted by US personnel in 2002 and afterward (when it was officially outlawed). Arguably, the film enables Bigelow to reveal her anti-American/anti-war bias again, like she did so painfully in the critically-acclaimed The Hurt Locker. Yet, it is doubtful that she glorifies torture here. Instead, she lets viewers decide for themselves, in a similar vein to Rendition, if torture is ever necessary or useful, which is an intelligent way of kicking off a moral debate on an important and current subject. 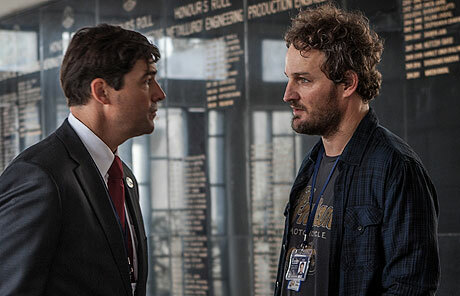 CIA agent Dan (Jason Clarke, right) arguing with his and Maya’s boss, Joseph (Kyle Chandler, left), as he tries to help Maya in anyway he can. But what is even more striking than the portrayal of ‘enhanced interrogations’ in Zero Dark Thirty is how the film has painted the War on Terror as merely Osama Bin Laden. Yes, he is the figurehead of modern-day Jihadi terrorism and his death is a symbolic hammer-blow to the cause. But by 2011 it is dubious how influential Bin Laden was to the pursuit of world Jihadism, due to the emergence of numerous Al-Qaeda splinter groups, such as Al-Aqaeda in the Arabian Peninsula (AQAP) and Al-Shabaab, among others. Yet, these other terrorist groups are barely given a mention, which is strange considering the security threat they pose to the world. However, if one can ignore the lack of political background, one can enjoy strong performances from all the cast. At the forefront, is Jessica Chastain, who demonstrates, for the first time, that she can play a leading role just as solidly as she can a supporting one when given the chance. Her single-minded character, Maya, is given the central task of finding Bin Laden. Maya might get her way sometimes in a contrived manner for reasons of plot, but Chastain looks so natural in the role, and the way Maya changes under the circumstances is indicative of Chastain’s talent. 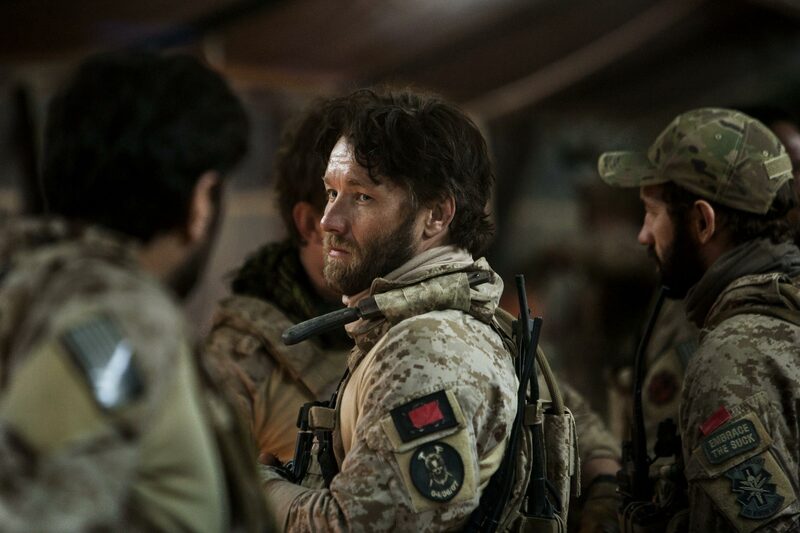 Patrick (Joel Edgerton) enjoying banter with his marine companions before leading them to into combat to kill Bin Laden. Maya’s solemnity is in mild contrast to her two main colleagues, the tough-yet-amusing Dan (Jason Clarke) and the bitchy Jessica (Jennifer Ehle). Both Clarke and Ehle play well, and are more empathetic than Maya. Nevertheless, they are both outshone by Chastain’s performance. Over-all, Zero Dark Thirty is a sincere and honest attempt to recreate the finding and killing of Osama Bin Laden. That one knows how the movie will end is irrelevant, as it is an engrossing and tense watch. The film might be devoid of much of the current context vis-à-vis the War on Terror, and it might be overly-simplified; yet, what it lacks on those fronts, it makes up for in compelling performances, not least from Jessica Chastain. Furthermore, Zero Dark Thirty sends out a stark message to America’s enemies: it doesn’t matter where they hide or for how long they hide, America will find them and bring them to justice.